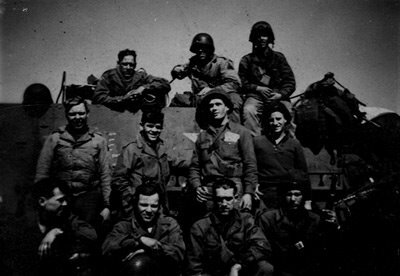 Now, I'm off to take my father, late of the 27th Armored Infantry Regiment, 9th Armored Division, to the range, followed by a football game this evening. My Dad is in the center row, far right. I'm sure all you gunnies have heard that the bliss ninnie majority in San Francisco have approved a ballot initiative (Preparation Proposition H) that bans the manufacture, distribution, sale and transfer of firearms and ammunition in San Francisco; along with a Measure H, which bans the possession of handguns. Even though a lot of people and organizations are suing, both Proposition H and Measure H will survive. After the court challenges are over, crime will slowly start to rise as the criminal element figures out that SF has become a target-rich environment. Most handgun owners will not turn in their guns, choosing to become criminals rather than be disarmed. Anyone who used a handgun to defend themselves will be arrested for illegal possession of a handgun. Some poor joker is going to be arrested for reloading ammo in San Francisco. Some number of individuals and business will leave San Francisco (and probably California altogether) for freer climes. More bliss ninnies will move to San Francisco because it's friendlier to their beliefs. They will serve as fresh meat to the criminal element. As crime increases, so will the cries for government to do something. The Big One will finally hit and solve this problem for us by wiping San Francisco off the map, eliminating bliss ninnies by the hundreds of thousands. OK, I'll admit it. That last one's more of a hope than a prediction. Sony music, root kits and "What were they thinking?" Some enterprising trojan writer has figured out how to take advantage of it. However, we're getting some help from some of the antivirus companies. Some of them are taking this seriously, and are adding this to their list of malware to be deleted when found. Please note that one of the largest and most popular vendors among home users, Symantec, is only identifying the software, not removing it as they should. Home PC users, you might take this as a data point in your purchasing decisions. One of these days, the music industry and the movie studios are going to learn that trying to lock their content up too tightly is always going to backfire. If they'd just make it easily available for reasonable prices with reasonable restrictions, they will make money in sinfully large piles. Have you ever felt that your workday, maybe even your life, was experienced in small fragments? Worse yet, every time you try to "get something done", someone or something interrupts you? As a professional computer geek, I get this feeling all the time. I'm trying to do some research for a project, and email dings. While I'm reading the email, the phone rings. While talking on the phone and trying to read the email, someone shows up at my door. Waving to them to take a seat, I try to finish the email and the phone conversation at the same time to so I give my visitor a time slice. How about this--You have to work late. Your spouse takes your son to ball practice and your daughter to dance, but then has to go to their evening class. You leave work and pick up daughter at dance, then run to your favorite big-box retailer to pick up some stuff. Spouse gets the son after her class is over (but he had to kill 15 minutes waiting for them to arrive, and everyone meets somewhere for supper, which is at 8:30. Then you run home, get the kids through the bath routine and off to bed. Then you VPN into the office to finish a few things while your spouse does homework. Nah, none of us ever have these problems. While perusing the latest Infoworld, I ran across a mention of an article published in the New Your Times Magazine, "Meet the Life Hackers." A quick Google turns it up on the web. Go read this article. I'm not going to try to summarize it for you; I think you need to read the whole thing, mentally digest it, then read it again later. That's what I plan on doing, then seeing if I can apply some of it to my life and see if it really makes a difference, or if it's just different. It should be an interesting experiment. I've been catching up on Fred Reed's columns. Fred's always a good read, but this one on PMS is better than average. Ducking and weaving, he said "And it has the advantage of truth!" It's a curfew! Run, Achmed, run! The French government has declared a state of emergency and imposed a curfew after 12 nights of rioting and burning. Let me explain this to the French in simple terms. They're rioting, burning cars and buildings, setting old women on fire, beating old men and now it's spreading to other countries. Do you morons think they're going to worry about violating a curfew? Europe may get through this, at least this time. However, their restive Moslem population now knows how far they can go, and next time they'll go there and then push a bit further. Next time, further. Eventually, given the European penchant for "accommodation" (love that word), Europeans will be minorities in their own countries. Perhaps they should call the Israelis for advice? "What the French need to do, but won’t, is to send the army into the Islamic slums, round up the whole lot, and put them ashore on the beaches of North Africa with a box lunch and a coupon for three free Dunkin Donuts. It isn’t a pretty answer. It’s a lot prettier than what seems to be coming down the pike." I've commented before that I don't watch much TV. However, if this concept works out for CBS and NBC, I think other networks will be quick to adopt it--and you might see me watching more TV (making the assumption that there is something on I deem worth the effort). Of course, they want to do this by pushing it to a DVR that you're paying a subscription to use, and I'll bet that you won't be able to burn a copy of the show, but at least they're starting to get the idea. Now when they make them available as $0.99 video downloads via the Internet, they'll really be onto something. But I won't be holding my breath. Old media isn't enthusiastic about changing, and they're only going to do so kicking and screaming. But it is fun to watch. Anyone got earplugs? OK, I'm late to the party, like usual. I didn't see Firefly on TV, and I wasn't one of the first in line to see Serenity in the theater. If that makes me less of a fan, well, TS. So Sunday, Mrs. Freeholder and I make a trip to one of the local cinemas, without the children, to partake of Mr. Whedon's work. Mrs. Freeholder was in more of a "good sport" mode, but at least she went. Even she was impressed, if marginally. Her take was that it reminded her in some ways of Buffy the Vampire Slayer. She pointed out something that I wouldn't have noticed--most of the cast had been in Buffy or Angel at some point, and most if not all played bad guys. Me, I guess I'm just easy. I was pretty impressed. I suppose it's due, in large part, to my sympathy for the story line. Being from the South, I have an inbred affinity for underdogs. Add to that a more than superficial resemblance to the Southern diaspora that occurred after the late unpleasantness, and I guess I'm just ripe to be a sucker for the show and the movie. I also appreciate that Whedon didn't monkey around with the characters, he didn't muck up the story line and some more things got explained. They did fiddle with the music, making it more "cinematic". I'm not sure if it's better, worse or just different. Without doing a spoiler, I'm not happy that there are some things that will now be difficult, if not impossible, to explain. I would have really like to had some answers to those questions, but as in life, I guess some questions must remain unanswered. Edit: Claire Wolfe is reporting that Serenity ships on 12/20, and is available for preorder at here at amazon.com. Oh, and you can get Firefly too. Gullyborg has again blessed us with a new Carnival of Cordite, this week featuring small furry creatures with guns. Also, while Gullyborg notes this post from Says Uncle, I want to particularly draw your attention to it, since it involves one of my very favorite alphabet agencies. 30,000--that's the population of a large town or a small city. It's the number of seats in one of the smaller major league baseball fields. It's the size of a US Army Corps. 30,000 is 100 times the historical average of these letters, which first came into use with the passage of the Electronic Communications Privacy Act in 1986. "The Department of Justice inspector general in August 2005 found no civil rights violations with respect to the Patriot Act." The Patriot Act. Well, now. There are no civil rights violations under the Patriot Act. That's comforting. I guess the US Constitution doesn't apply in this case, huh? Edit: Gunner at No Quarters has an interesting take on the subject.